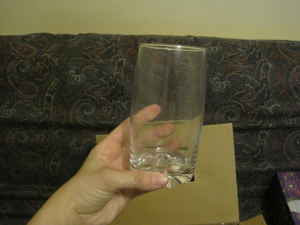 I saw your ad on craigslist for the 12 Drinking glasses - never used http://toronto.en.craigslist.ca/tor/hsh/1503216559.html. They look super great but I just have one question: What the heck is all over your hands that you made a "never used" glass that filthy while trying to take a photo of it? Are you a purveyor of unpackaged butter? Anyway I can't wait to take that first golden brown sip of water. Are they still available?